A 10 ft snake, a meerkat and a tarantula and all before lunch too. It is arguably the most important thing that Butterflies do at their sessions and that, is to provide a distraction: some breathing time away from whatever is going on elsewhere. Mondays at the Men’s Group - held Community Centre, Garden Village - is a chance for the menfolk to have some time to socialise, perhaps do a bit in the garden, before eating lunch together, cooked on the premises. Today the group received a special visit from Zeus and Buddies Animal Encounters based in Grimsby/Cleethorpes, who promise: ’To bring the zoo to you.’ As Izzy and Ashley bring in the differently-shaped boxes and cages, a general chit chat about animals begins around the table. 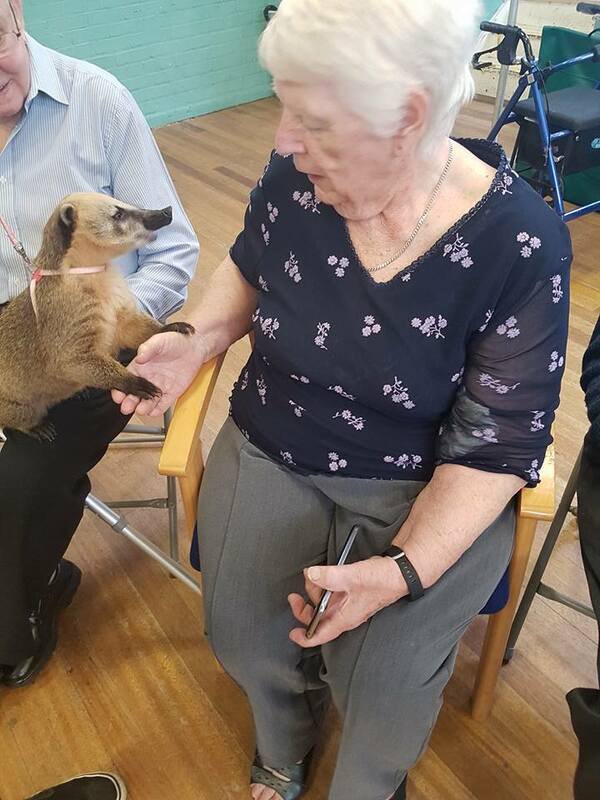 Introducing us to 2 year old Zeus the meerkat from S. America - and also the travelling zoo’s namesake - the handlers explain some of meerkat behavioural traits, while allowing those who want to, the chance to stroke or hold him. Some of the group really take to particular creatures like the bearded dragon, or Tonka the three-banded armadillo. Everyones’ eyes light up, as one-by one these strange exotic creatures are brought from their cages to creep into crinkly palms, crawl and skitter about the floor. A coati - a sort of Mexican racoon - pads happily across peoples shoulders, being fed grapes and spitting out the skin. Zeus curls up on a lap after a meal of mealworms and on the other side of the circle there is a sulcata tortoise being passed around. ‘He’s the third largest tortoise,’ Ashley the handler explains. Right now he can fit inside a small palm, but full size this African species, could grow to 33 ins and weigh up to 105kg! Something I expect many people don’t know, is that the tortoise is sensitive to touch through their shell and also, the shell is actually made of keratin: the exact same thing as Rhino horn and the same substance that make up our fingernails. 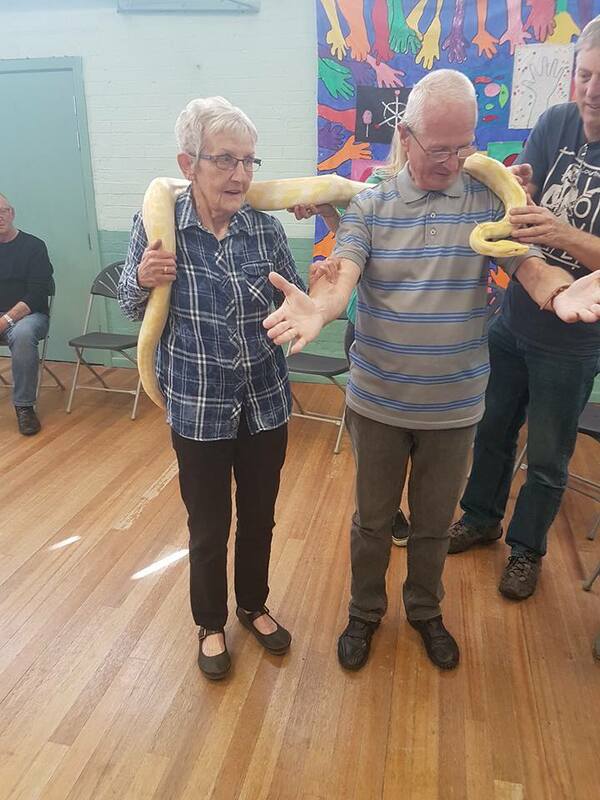 This session is all about dispelling myths and misconceptions about animals, giving people the chance to overcome fears and experience being close to them in a safe, secure and relaxed way. The handlers from Zeus are incredibly professional and they put everyone at their ease and quite a few people perhaps surprised themselves by how far they managed to engage with the animals. The corn snake and the crested gecko both have the group smiling, marvelling at their markings and movements - ‘He’s lovely, just one more hold,’ says Charlie. There’s a lesser tenrec called Bramble - a tiny hedgehog from the forest floors of Madagascar - apparently he is a cousin of the elephant and a sea cow: ahh the wonder of nature. It is a rare opportunity to get up close and personal with non-native species, without a tiring trip somewhere, this way our group - some of whom are infirm and unsteady on their feet - can have the animals brought right to them. All morning Zeus and his friends have been delighting everyone. Brenda and Charlie are ready to kidnap the meerkat and everyone seems taken with Tonka, the prehistoric armour-plated wonder: the only breed who can curl up into a perfect ball. Now it’s time for the tarantula - an adult female Chilean Rose tarantula to be exact - and as expected she gets a slightly different response: still, quite a few are brave enough to have her sit in their hands for a moment, including me. The last of our visitors was a ten-foot long bright yellow Burmese python, who rests heavily on your shoulders, and then moves in strange fashion scaly and warm: not slimy at all. ‘All my animals love you,’ says Izzy at the end of the session. These kind of experiences are beneficial to the members, can stimulate conversations and interactions with the animals and each other, but above all, they are fun and who doesn’t want a little bit of fun in their lives.